I’m still in the process of decorating my house. We put things on pause in mid-November (no more projects during the holiday season! ), but I’d really like to get some new bedding. I’m looking at linen duvets, and (1) this set by Kiss and Tell via Amazon is a fraction of the cost I’ve seen around the design blogosphere for similar sets. This could be a great gift option for any new couples or new homeowners on your list. I love these (3) double old fashioned glasses by my fave housewares co Rosanna, Inc. Barware is always an awesome gift to give and receive, you could also up your hosting game by buying them for yourself. I got really into essential oils this year, so if you’re considering it I’d recommend (4) this starter kit. You can read this post I wrote on making your own soap, too! I don’t think you can ever have too many blankets, and I’m eyeing this (10) tartan blanket for my living room. It subtly hints at the holidays without screaming Christmas. It’s a perfect family gift or a little luxury for someone you think is worthy. (8) hot pink ballet flats fit the bill. If you want something a bit more winter appropriate, how about the Liberty bootie by Dansko. The saddle leather looks awesome, and Danskos are my winter go-to shoe. I have both the Maria (in taupe) and the Laura (in purple) and I think both are very comfortable and well worth the price tag. Shoes are an awesome gift to give and get! I am also a fan of nail polish gift sets. I like to try new colors without committing to a full size. I’ve received one by Butter London in the past that I love, but this season I’m eyeing the sets by Zoya. I particularly love All Spruced Up. I am a sucker for dark, vampy polishes, and for the price you can totally afford to gift these to a variety of ladies on your list. I hate shopping for the men in my life. There, I said it. There are just sooooo many (three dads, three brothers, 1 husband). My standby gift for dudes is snacks from Trader Joe’s, and my other one is housewares. Yep, you heard me. The wedding gift we use the most in my house is this (9) cast iron griddle. You cannot beat the price for an entire Lodge Cast Iron Cookware Set either. You can also drop subtle hints that you’d like some french toast cooked on that griddle if you pair it with bourbon maple syrup. Ha! The thing Nick wants the most this season is a nice fleece like this (12) jacket by Patagonia. You can find them in a variety of price points at tons of stores (Costco, Old Navy, etc.) but Patagonia is a solid investment for someone special. I struggle buying gifts for kids. I have mixed emotions about toys! Rory’s favorite thing I’ve bought him all year is a backpack. He’s fond of this (5) backpack featuring Toca Boca characters (they make great video games for the iPad!). It’s the perfect petite size for toddlers. Green Toys are awesome and I saw my son gravitate toward this (6) playhouse set at a local kids store. I like that this is a toy he can use for years and won’t be immediately bored of it. Imaginative play is so important, so why not gift this (7) cape set with a space theme. It’s just too cute. If you’re looking for gifts for babies, you can’t go wrong with books like BabyLit primers or bedtime standbys like the Llama Llama series. I have (11) Air Pods. I love them. Save your Christmas cash and get them for yourself, or give them to someone you treasure. 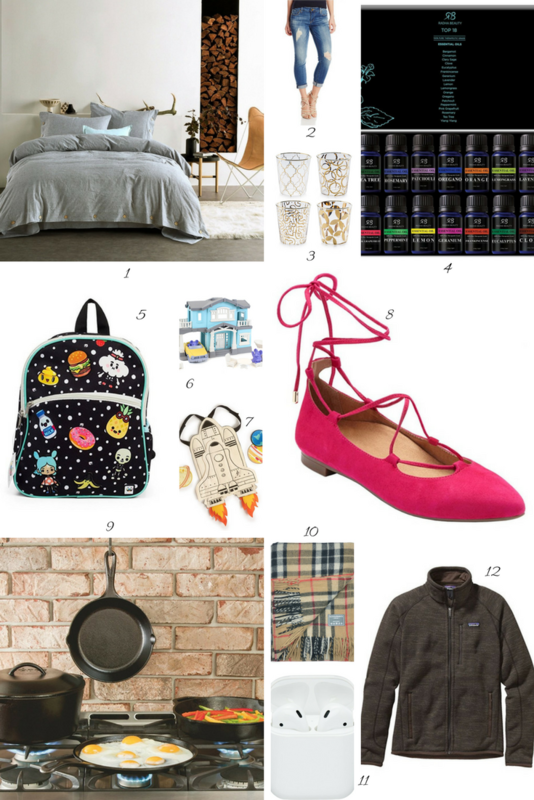 I hope this roundup inspires you to shop for both functional and fashionable things this holiday season!